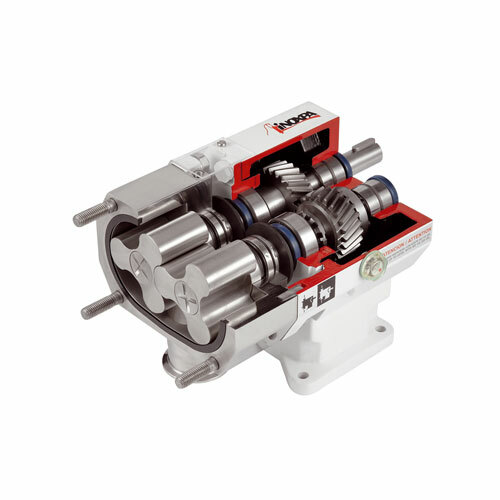 The HLR pump is a hygienic rotary lobe pump designed in compliance with the EHEDG specifications for plants and processes that comply with the strictest hygienic requirements. 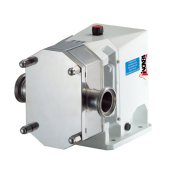 Due to the low working speed, the rotary lobe pump is characterised by a gentle pumping and low shear of the product causing less damage possible. 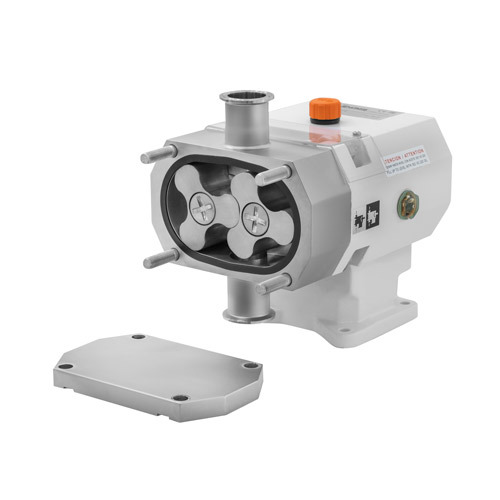 This hygienic lobe pump is an ideal pump for the transfer of all types of liquids (from 1 to 1.000.000 cP) and liquids with solid particles (curd, biologic cultivations, etc.). 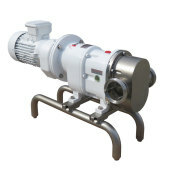 The rotary lobe pump is adequate for the food-processing, cosmetic and pharmaceutical industries. The HLR rotary lobe pump basically consists of two lobe rotors which rotate inside the casing without touching each other. As the rotors rotate, the space between the lobes and the casing is successively filled with the product which is driven to the discharge nozzle displacing a fixed amount of product. The pumped product forms a continous stream due to the adjusted tolerances of the lobes and the pump casing thus ensuring an efficient pumping. Hygienic design of the attachment of the lobes. Sanitary mechanical seal, internal assembly. The seal is disassembled from the frontal part without disassembling the casing of the pump. Gaskets with deformation limiters prevent any dead leg. Pump certified according to the EHEDG standards. Flushed or balanced mechanical seal. Bi-wing lobes. Relief valve or external by-pass. Ra ≤ 0,5 μm surface finish for pharmaceutical applications. Horizontal assembly (no EHEDG certificate). Various types of drives and protections (gear motor with frequency converter, etc.). Assembly on a 304 stainless steel baseplate on silent-blocks, sanitary design. Connections: Clamp DIN32676, DIN 11864-1, DIN 11864-2, etc. Material certificates (3.1), roughness certificate. 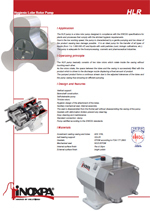 The pump can be ATEX certified. Summary La pompe HLR est une pompe à lobes rotatifs à déplacement positif; Elle a été conçue selon la norme EHEDG pour les installations et les procédés qui répondent aux critères hygiéniques les plus exigeants. Summary La pompa HLR è una pompa a lobi rotativa di spostamento positivo disegnata secondo la normativa EHEDG per le installazioni ed i processi in accordo con i requisiti igienici più esigenti. Summary Die Drehkolbenpumpe HLR ist eine Verdrängerpumpe, deren Design die EHEDG-Richtlinien für Anlagen und Prozesse mit höchsten Hygieneanforderungen erfüllt. Summary Кулачковый насос HLR изготовлен согласно спецификациям EHEDG для установок и процессов, отвечающим самым строгим требованиям к гигиене. Summary Las bombas lobulares HLR de INOXPA forman parte de nuestra amplia gama de bombas rotativas de desplazamiento positivo para líquidos viscosos. 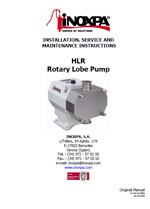 Summary The HLR rotary lobe pumps by INOXPA are part of our wide range of positive displacement rotary lobe pumps for viscous liquids. Summary Les pompes à lobes HLR d’INOXPA font partie de notre large gamme de pompes rotatives à déplacement positif destinées aux liquides visqueux. Summary Le pompe a lobi HLR di INOXPA fanno parte della nostra vasta gamma di pompe rotative a spostamento positivo per liquidi viscosi. Summary HLR – это семейство роторных насосов объемного действия предназначенные для перекачки вязких жидкостей.